Cher has recorded the ballad “I Hope You Find It” written by Jeffrey Steele and Steve Robson on her new record “Closer To The Truth” out now. She has been performing the song this week on the Today Show and Letterman. Check out the videos HERE and watch the official lyric video HERE. Be sure to check out the new Keith Urban record FUSE! It includes “Raise ‘Em Up” written by Tom Douglas and Jaren Johnston and Steele. The song features Eric Church as well! Get the whole album HERE. Join Jeffrey Steele, Al Anderson, Bob Dipiero, Tim Nichols & Criag Wiseman for an evening of hits at the Fallsview Resort and Casino! August 30th & 31st – Get tickets Here! See Jeffrey Steele down in Ket West for the annual Key West Songwriters Festival this weekend! 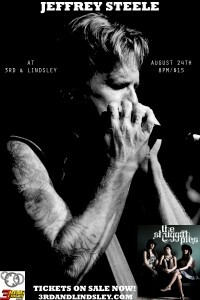 Tonight at San Carlos Institute 8pm w/ The Shuggah Pies and Saturday at Smokin’ Tuna at 5pm! Catch Jeffrey Steele at the Key West Songwriter’s Festival! Tickets for Jeffrey’s 3 performances at Joe’s Pub May 31st 7:00pm & 9:30pm, June 1st 7:00pm are on sale now HERE.